Use to send and receive audio from your professional audio equipment. BlueDriver™ series of audio interfaces use Bluetooth Wireless Technology to send and receive audio from your professional audio equipment. 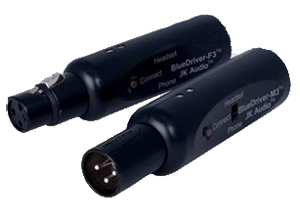 BlueDriver-F3™ plugs directly into a dynamic mic or the mic level output from a mixing console. Pair to your Bluetooth enabled cell phone or headset. The 3.5mm stereo jack contains a mic level output suitable for recording, with the clean mic signal on the left channel and the Bluetooth return on the right. BlueDriver-M3™ plugs into the mic input channel of a mixer. Pair to your Bluetooth equipped cell phone or headset. The 3.5mm jack will accept a signal from the headphone output of the mixer for transmission back to the cell phone or headset. Headset Connect: Pair BlueDriver™ to your 3rd party Bluetooth headset. Some Bluetooth headsets allow you to switch between your audio device and a cell phone. Phone Connect: Pair BlueDriver™ to your cell phone to call into the station or bring in caller audio. The BlueDriver-F3™ is designed to plug directly into a dynamic mic or the mic level output from a mixing console and send audio from your professional audio equipment. Click here for alternative BlueDriver-F3™ applications. The BlueDriver-M3™ is designed to plug into the mic input channel of a mixer and receive audio from your professional audio equipment. Click here for alternative BlueDriver-M3™ applications. BlueDriver-F3™ = 3 pin female XLR, 1k ohms, -34dBu nom. BlueDriver-M3™ = 3.5mm stereo, 20k ohms, -10dBu nom. BlueDriver-F3™ = 3.5mm stereo, 1.1k ohms, -34dBu nom. BlueDriver-M3™ = 3 pin male XLR, 1k ohms, -34dBu nom. * The Bluetooth word mark and logos are owned by the Bluetooth SIG, inc. All trademarks are recognised.